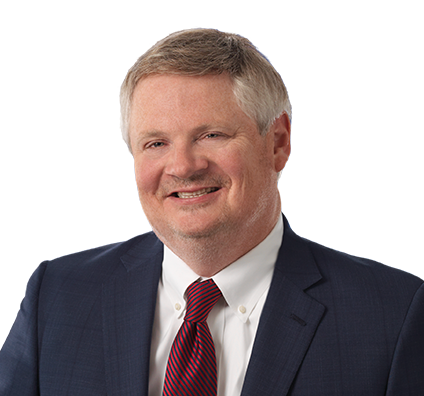 Jim concentrates his practice in the areas of shopping center law, commercial real estate acquisition and development, leasing, residential real estate, and finance and commercial lending. In addition to serving as the lead project attorney for the development, acquisition, renovations and expansion of shopping centers located throughout the United States, he also serves as counsel for both landlords and tenants in a variety of real estate activities, including negotiating leases and related agreements with national and regional tenants and developers. Negotiating leases with a variety of retailers, including “big-box” tenants and department stores. Handling the sale of outparcels and the disposition of shopping centers. Purchasing existing shopping centers and developing new shopping centers in a variety of states. Jim also advises banks and lenders on numerous matters involving residential, construction and permanent loans, as well as other sources of financing. He counsels property managers regarding retail, office and other commercial projects and handles the formation of corporations, partnerships, limited liability companies and other entities for purposes of owning, developing and managing a variety of real estate activities. Involved in all aspects of the preparation of the national tenant leases and financing-related aspects – including subordination and nondisturbance agreements (SNDAs) and collateral releases – for a new 8,000-square-foot retail building on approximately 1.5 acres adjacent to St. Clair Square Mall in Fairview Heights, Ill. Represented a major manufacturer based in Chattanooga, Tenn., on the sale and development of property in Dalton, Ga., for use as a Kohl’s department store and related retail shopping center development. Completed 10 leases with various national and regional restaurants in eight different regional shopping centers throughout the country that exceeded 55,000 square feet of new and existing space. Handled the negotiation of five portfolio leases with a large retail cosmetics store. Completed five leases with a national sports shoe and apparel retailer at four different regional shopping centers throughout the country that exceeded 18,000 square feet of new and existing space. Represented a major shopping center developer based in Chattanooga, Tenn. on the sale of Lakeview Pointe Shopping Center in Stillwater, Okla.; the negotiation of 15 portfolio leases with a large retail cellular phone provider; and the negotiation of three big-box leases totaling 150,000 square feet.